For general wiring of homes, stores, and shops. 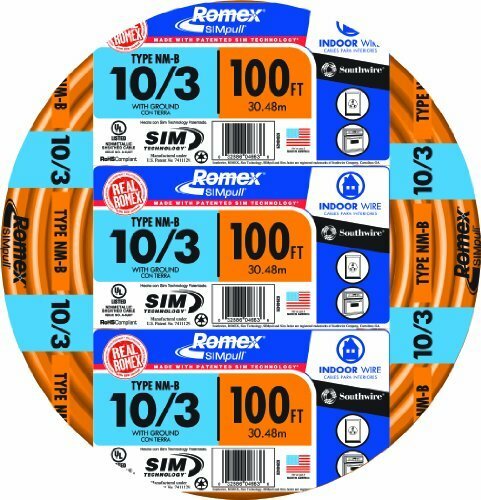 Southwire Romex Brand SIMpull NM-B (nonmetallic-sheathed) cable may be used for both exposed and concealed work in normally dry locations at temperatures not to exceed 90°C (with ampacity limited to that for 60°C conductors) as specified in the 2011 National Electrical Code. NM-B cable is primarily used in residential wiring as branch circuits for outlets, switches, and other loads. NM-B cable may be run in air voids of masonry block or tile walls where such walls are not wet or damp locations. Voltage rating for NM-B cable is 600 volts. If you have any questions about this product by Southwire, contact us by completing and submitting the form below. If you are looking for a specif part number, please include it with your message.